You may remember the Marley Spoon recipe box we received in December, well, one of the dishes had to be re-invented, as I managed to drop the prepared butternut squash on the floor, and it was unsalvageable. Opening the fridge, I saw a pack of bacon, and bacon makes everything better right?! 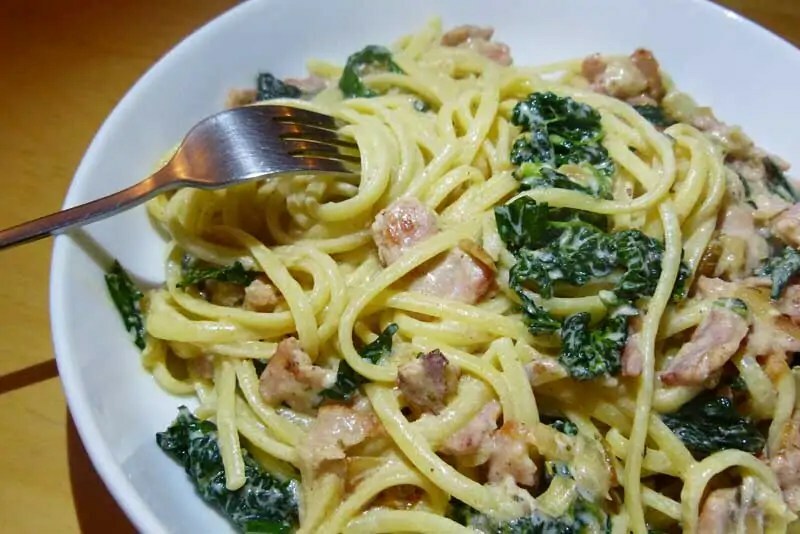 Using the ingredients I was sent in the recipe box – linguine, cavolo nero (a type of kale – use regular kale or even spinach if you can’t find it), crème fraîche, and sage leaves to create this creamy linguine with bacon and cavolo nero – and it was delicious! Cook the linguine in a pan of boiling, salted water for around 10 minutes, until tender. Meanwhile, heat some olive oil in a large frying pan, and cook the bacon for a couple of minutes. Add the shallots and garlic cloves, and when cooked, add the cavolo nero and sage. Drain the cooked pasta, reserving some of the cooking water, and add the pasta to the pan with the bacon mixture. Add the crème fraîche, and some of the reserved water, and toss together. Add the grated parmesan, and season with salt and pepper to taste.